Welp, I'm A-Movin. Will You Come Visit Me? Well, I've been working over at Typepad all weekend. I was able to transfer all of my previous posts over there. I just have to add all my sidebar stuff and I'll be good to go. So come on over to http://donttrythisathome.typepad.com and see what I'm up to. I'll be waitin' for ya. Betcha can't guess what I did this weekend. Betcha can't. So I'll tell you. I hooked up my camcorder to my computer and talked to my brother in Bahrain! We could see each other and hear each other. It was so cool. Then we called my dad in CO and we video conferenced with him too! All three of us! What can I say? It really doesn't take too much to entertain me. Ah Yes. To Be Eight Again. In the car today running errands, Max and Wild Thing were discussing the finer points of burps. They agreed that they had both had burps that, when they happened, tasted. "Yeah," said Max, "like when I have donut! Sometimes later I burp and it tastes like the donut." Then, a split second later and with a wistful smile in his voice he said, "Extra for me." Later we were getting lunch and Hilary Duff's song The Beat of My Heart came on the radio. Max started singing! I'm used to Wild Thing belting out a few tunes and even making some up, but Max does. not. sing. EVER. So I look back and smile at him. I have all the warm fuzzies you can imagine. He's really singing! Then he sings a little louder and I can hear what he's saying: The beat of my fart. He dissolves into 8-year-old laughter. I've been had again. Last night I was having weird dreams. WEIRD. Here's the back story: Before I went to bed I was stressing out about the fact that next year Max will be in third grade and the homework will be ridiculous and copius. This will eat into our family time. I'm annoyed. I also go back and forth between wanting to homeschool (I wouldn't be effective in this endeavor and it completely overwhelms me) and wanting to send them to a small private school and just wanting to keep them where they are (great public school). All this was floating around in my head and this is the dream I had. I was going to school for eight hours and half the time the teachers didn't show up when they were supposed to. When they did show up they were re-teaching me things I'd already learned and saying it was the new math program. I was highly annoyed. Then, after school was over, and I was completely ripped, I was trying to leave. They wouldn't let me leave until I filled out some comment forms. The catch was that they were trying to tell me how to fill them out! If you thought I was mad before, you ain't seen nothin'. I was sooooo angry. So angry that I actually sat up in bed and started yelling, "I'm a Libertarian and I'm happy about that! You can't tell me what to do!" My husband calmly told me to wake up and go back to sleep. In other news, will you check out my posts on Typepad? Shannon has been telling me of all the fantastic wonders of Typepad and I decided I should try it out. 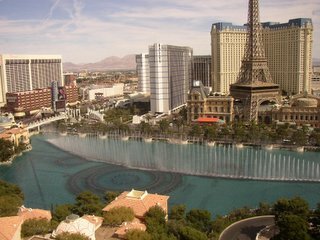 I've posted a few things about Vegas there, including the post below where the photos aren't showing up. 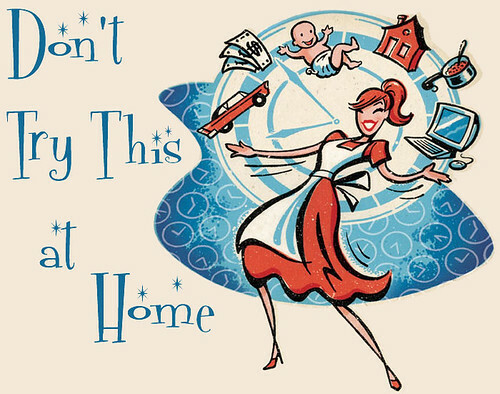 Here's the link: http://www.donttrythisathome.typepad.com/. I'm still mostly going to be posting here so make sure this is where you come first. ;) I'll let you know if/when I make the switch. Thanks! The past two weeks have been extremely busy for me. I made an impromptu decision to drive to Iowa to attend my grandparents’ 60th wedding anniversary party and my husband and I had a quick get away to Las Vegas. Whew! That’s a lot for me, especially when the kids are starting t-ball and baseball and spring is dancing outside. 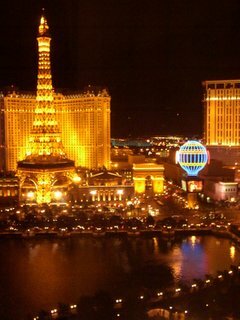 I’ve told you about Iowa, now it’s time to tell you about Las Vegas. Husband and I like to vacation together without kids at least once or twice a year. We both miss the kids terribly so we usually aren’t gone more than two days. The vacation is worth it, though, because we find that we can reconnect and relax on a different level. Our trip to Vegas was no different. Well, except that it may have been the best vacation yet! We relaxed, we talked, we gambled (and lost), we drank, we ate, we shopped, and we fell in love for about the 50th time this month. Husband was attentive, flattering (in a sincere way—not in a “can’t wait to get you back to the room” way), and thoughtful. He was so relaxed that Party Husband made an appearance. My husband is very reserved and that’s putting it mildly. Although we are both introverts, I am the more outgoing one. This weekend, though, he loosened up and we had some of the best conversations we’ve had in a while. He made jokes, laughed often, and chatted up everyone we met. It was so much fun to be with him and watch him enjoy himself. I've never forgotten why I fell in love with him, but it is so great to fall in love all over again. Have I mentioned that I love my life? Here is the lobby of the Bellagio (where we stayed). Each of the flowers is made of glass. They are amazing. I'm assuming they are held firmly in place, but I still didn't walk under them. Here is the view from our room! Phew! For some reason posting all those pictures was a nightmare. I'll tell you about the rest tomorrow. On my way to Iowa a few weeks ago, I was behind this bus. I really think it's funny and thought I'd share it with you all. 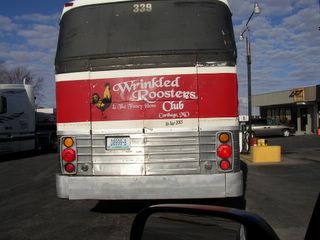 In case you can't read the name of the "club" it's The Wrinkled Roosters and The Fancy Hens! It was a bunch of senior citizens out for a road trip! I wonder if they all pooled their retirement money and bought this bus. I'll bet it's comfy inside! I sent my picture of me in my laundry room to Mommy Life and she actually used it! How cool is that? She gets mega-hits per day and she linked to my site. How cool is that? Had I been here and could have posted my guts out to get my traffic up (and also my TopBlogSites number) I would have loved it! 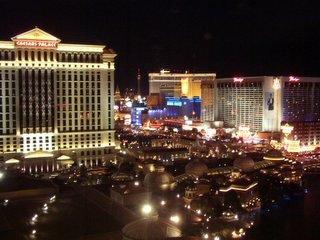 But, of course, I had to go to Vegas and miss all that. But I thank Barbara for showing the picture and for the link. 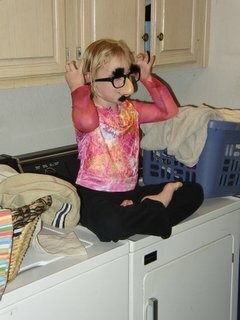 Here is Wild Thing's entry for the Laundry Room Roundup. I didn't actually send it in, I just thought I'd post it here. She would make a great Rafiki. I am the mother of two wonderful, funny children and I am lucky enough to stay at home with them. Please leave me comments. I love to know that people are stopping by. Larry Jones Illustration is responsible for my awesome title graphic. His work is copyrighted and for use by permission only. The Big 60th Anniversary Par-Tay!